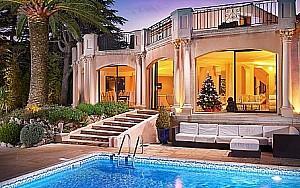 If you are looking for a lovely accomodation for your holidays on the French Riviera, you can find on PALM REAL ESTATE’s website a wonderful selection of villa rentals in Super Cannes. Consider a temporary relocation in one of our amazing luxury villas in Super Cannes for rent, which offer outstanding location, great views, high-quality amenities and unique luxury features. Situated in the hills above Cannes, just 10 minutes from La Croisette, Super Cannes is the most elegant residential area in the proximity of Cannes. Although it’s really close to the city center, Super Cannes is a wonderfully peaceful area, close to excellent golf facilities. Discover PALM Real Estate’s beautiful selection of villa rental Super Cannes if you want to make the most of your holidays on the French Riviera. Should you prefer a contemporary villa in Super Cannes located in a quiet sought after area, offering double living / dining room, fully fitted kitchen, 5 bedrooms with ensuite bathrooms, dressing rooms and numerous terraces with sea views, we would gladly help you find the perfect house to suit your lifestyle and budget. We are here to assist you in your research for villa rentals in the South of France. Our clients who search for properties located in private estates or benefiting from amazing panoramic views can also benefit from our expertise in villa rentals in Super Cannes. Browse our selection of villa rentals in Super Cannes and let us know which property provides the features that you would like to have in your vacation house. We offer our clients the most exclusive property portfolio of villas in Super Cannes for rent, excellent services and a completely secure experience when buying a contemporary villa in Super Cannes. Contact us after having carefully analyzed our offer of villa rentals Super Cannes and let our team composed of real professionals guide you towards the villa rental South of France you have always dreamed of.